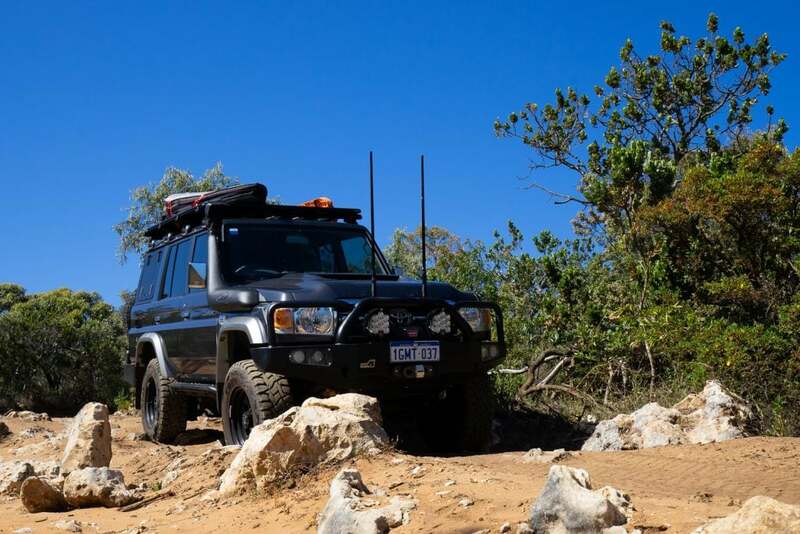 We fitted our LandCruiser with Toyo’s new Open Country Rugged Terrains (RTs) some 18,000 kilometres ago. They’ve done some solid work in that time, plus we’ve had plenty of interest in the tyres, so we thought it’s as good a time as any to share our thoughts. 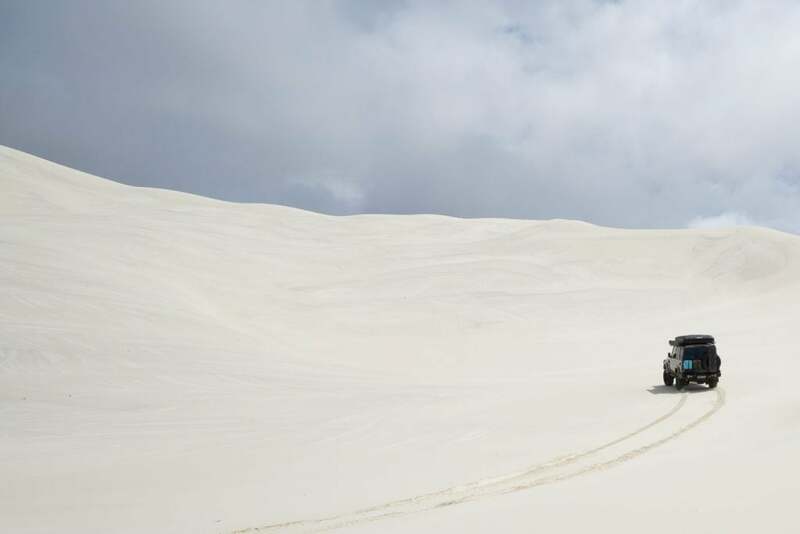 The Toyo RT sits in the emerging grey area between traditional all-terrains and mud-terrains. 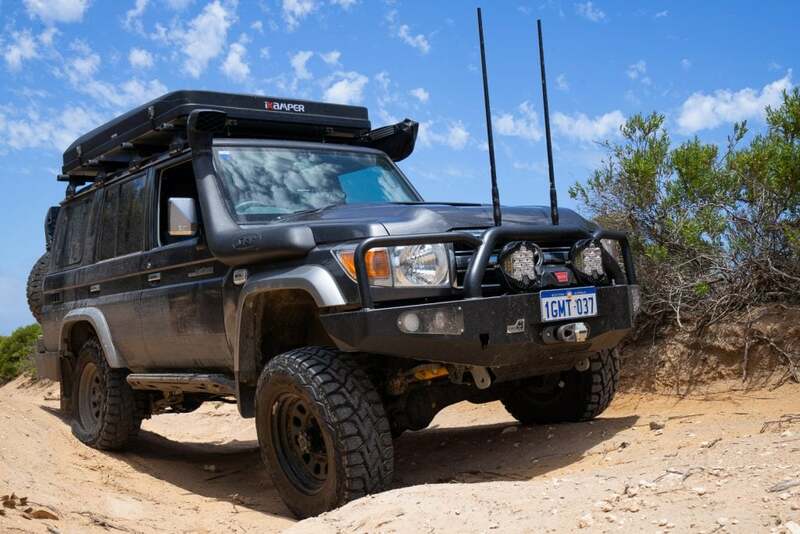 This grey area is home to a few quality brands making extra tough all terrains (or hybrids), like the RT, and a few mud terrains with much better road manners than usual. We fitted 28570R17s (close enough to 33”). It’s now approaching a year since the launch of the RT, and Toyo now have a fairly wide range of sizes to choose from. 33” we find tall enough for touring, and 16” or 17” rims leave plenty of sidewall for the right tyre to lengthen at lower pressures. On sand they’ve been performing well. Much of our soft travel has been with heavy touring loads too, and the sidewalls are firm enough to handle lower pressures, even with weight. 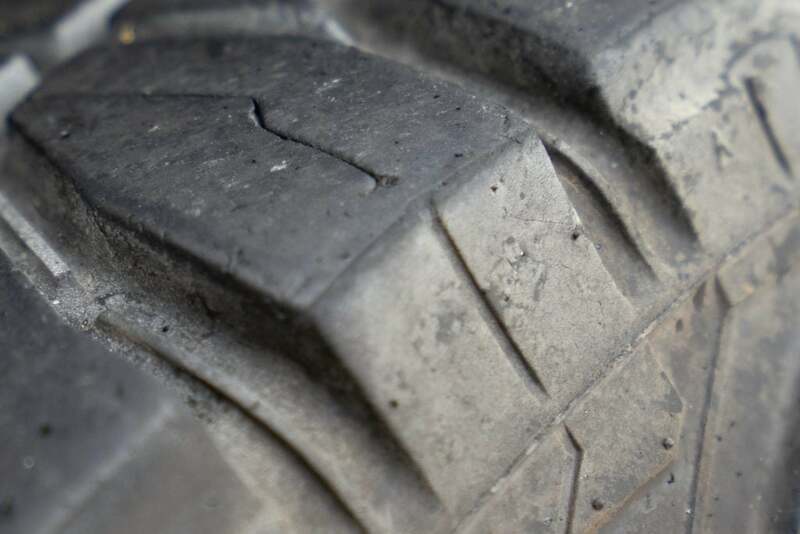 The extra thickness and tread in the upper sidewall of the tyre offers good additional protection, and its great to see this is becoming an increasingly common feature across brands. We’ve navigated over a range of rocks, including some super sharp limestone, and so far can report only superficial scrapes at best. 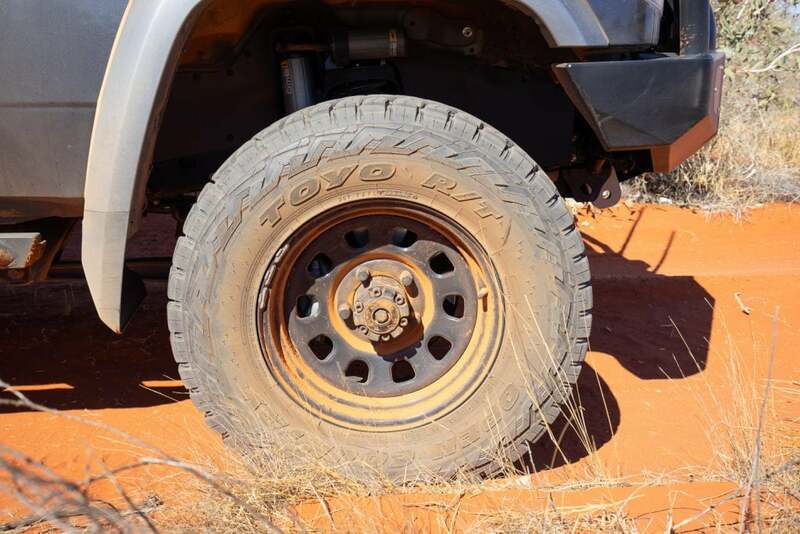 These are no full mud terrain, but the spacing between the lugs is wider than any all-terrain tyre so they do clear mud fairly well. The grips is good too. 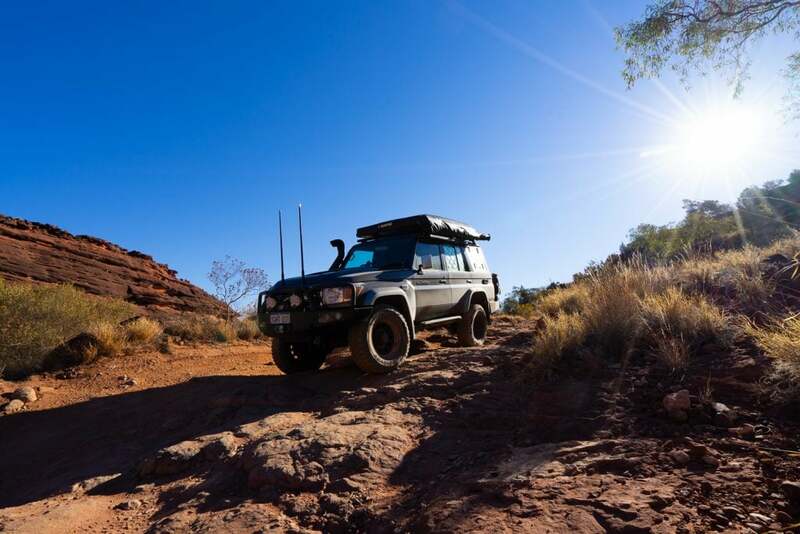 Without choosing a dedicated mud terrain, theses Rugged Terrains are about as close as you can get. 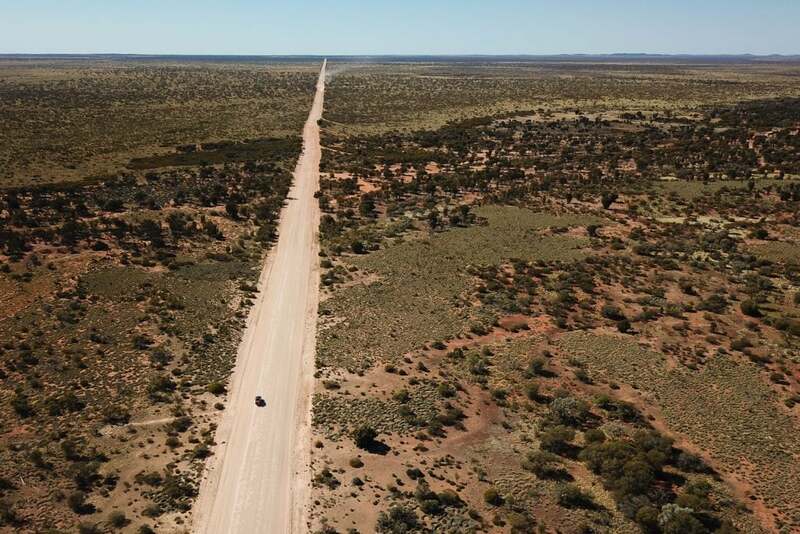 On dirt highways, like the Great Centra Road, they handled the endless corrugations, exposed rocks, and sharp shards from grading with ease. 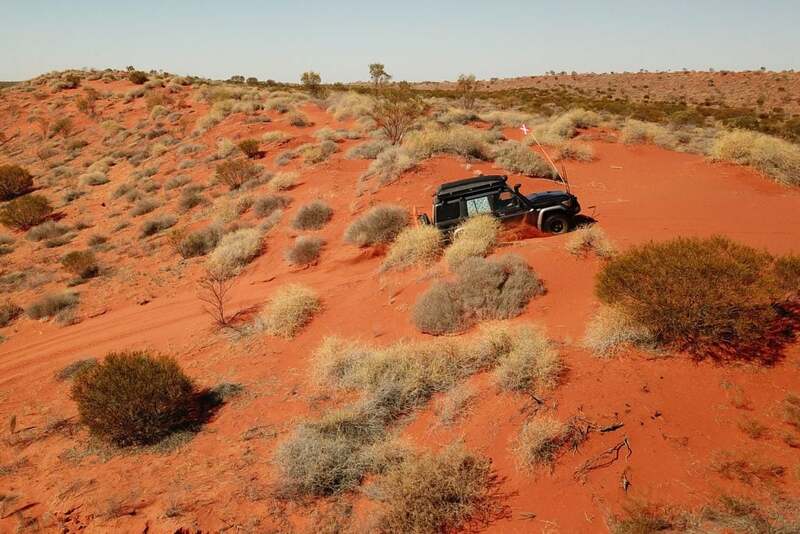 These types of roads can be especially hard on tyres. On the tarmac highways we haven’t noticed any real noise from the tyres, but we are travelling in a 76 Series, so this may differ in a modern quiet cabin, but again these aren’t a mud-terrain so they should be fine. The corners and edges of the lugs seem to be an area that’s commonly prone to damage. The below photograph was taken this morning and is indicative of all the lugs. It’s hard to say whether it’s the shape and size of the lug, or the compound, but either way they are holding up exceptionally well. 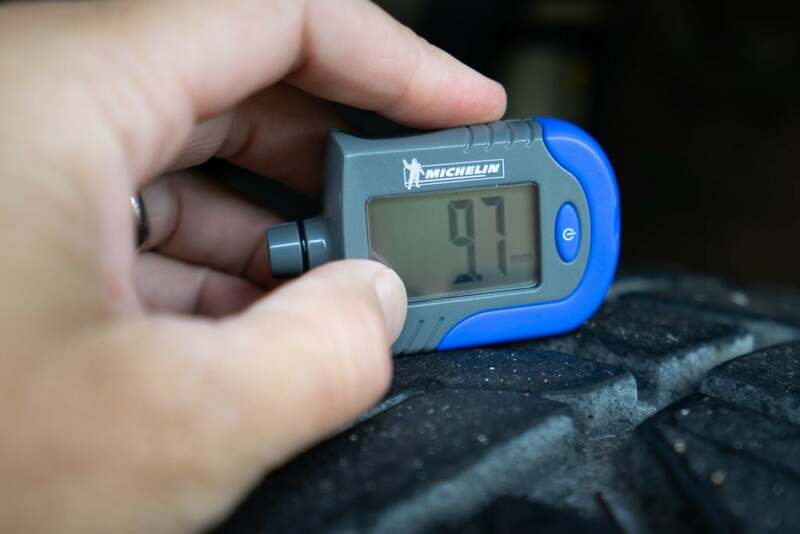 At new the RTs have 12.8mm of tread. 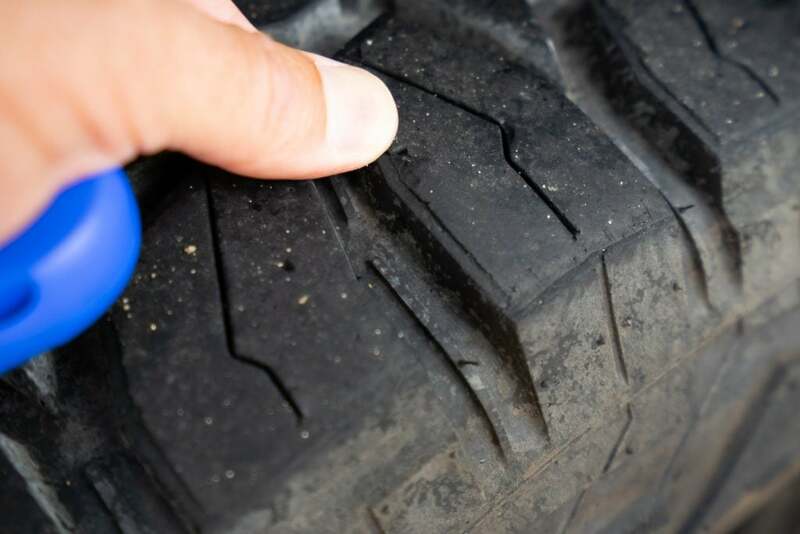 Our tyres are due for rotation, and seem to wear more heavily in the rear with the additional load. The fronts currently are sittings at around 10.6mm of tread on the edges and 10.8mm in the centre. The rears are sitting around 9.7mm in at the edges and 7.9mm in the centres. The extra wear in the centre of the rears is likely due to slightly high pressures. 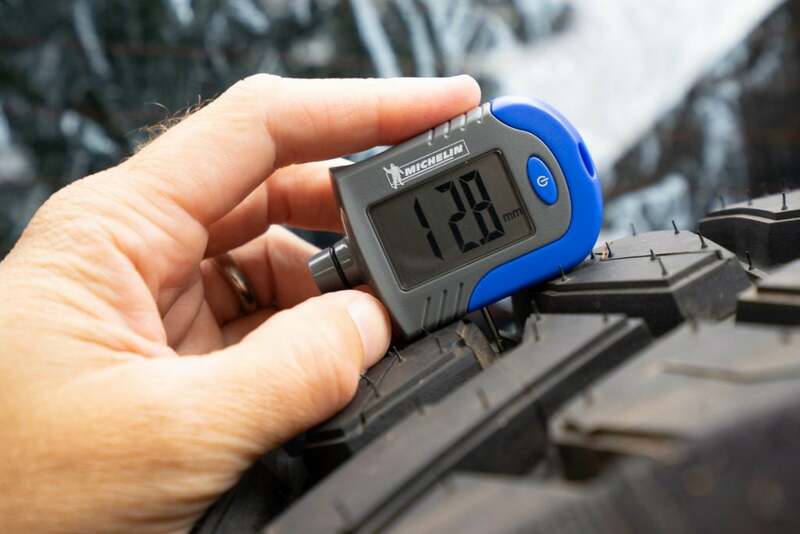 We’ve adjusted these, and have begun monitoring tread depth wear to help look after our tyres. 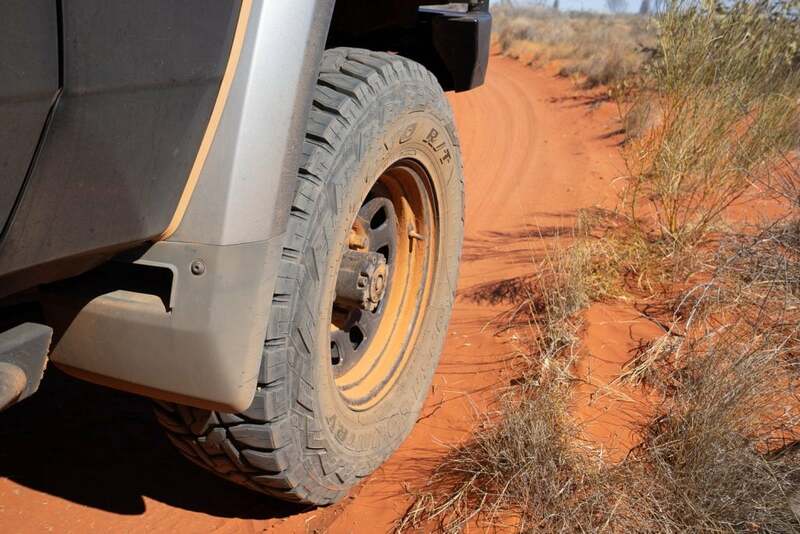 The RT is a robust tyre that’s really well suited to outback travel. 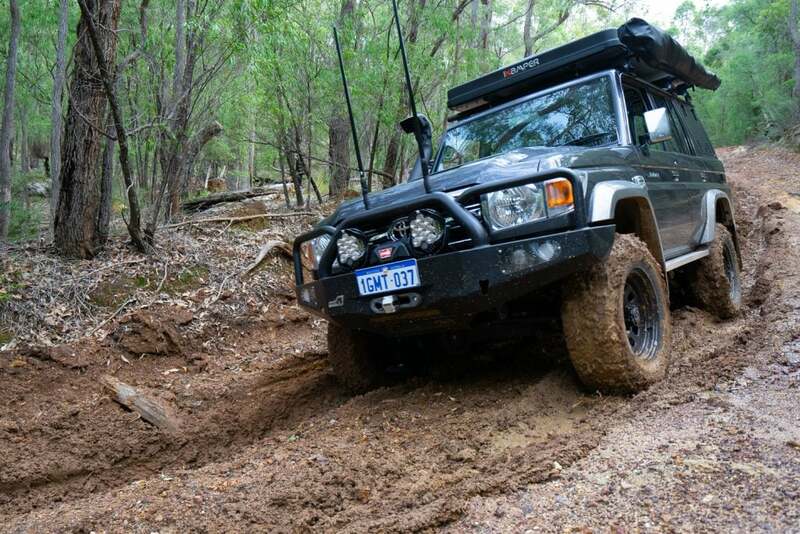 They will cover those bitumen kilometres fairly well, but still offer an extremely sturdy and well performing tyre once you head off-road.